Synthetic peptide: HGEQKIEAETRAV, corresponding to C terminal amino acids 901-913 of Human USP20. Our Abpromise guarantee covers the use of ab5272 in the following tested applications. Western Blot: Preliminary experiments gave no signal but low background in Human Liver extracts at up to 1µg/ml. Deubiquitinating enzyme involved in beta-2 adrenergic receptor (ADRB2) recycling. Acts as a regulator of G-protein coupled receptor (GPCR) signaling by mediating the deubiquitination beta-2 adrenergic receptor (ADRB2). Plays a central role in ADRB2 recycling and resensitization after prolonged agonist stimulation by constitutively binding ADRB2, mediating deubiquitination of ADRB2 and inhibiting lysosomal trafficking of ADRB2. Upon dissociation, it is probably transferred to the translocated beta-arrestins, possibly leading to beta-arrestins deubiquitination and disengagement from ADRB2. This suggests the existence of a dynamic exchange between the ADRB2 and beta-arrestins. Deubiquitinates DIO2, thereby regulating thyroid hormone regulation. Deubiquitinates HIF1A, leading to stabilize HIF1A and enhance HIF1A-mediated activity. Mediates deubiquitination of both 'Lys-48'- and 'Lys-63'-linked polyubiquitin chains. Belongs to the peptidase C19 family. USP20/USP33 subfamily. The UBP-type zinc finger binds 3 zinc ions. However, it does not bind ubiquitin, probably because the conserved Arg in position 55 is replaced by a Glu residue. Ubiquitinated via a VHL-dependent pathway for proteasomal degradation. Cytoplasm > perinuclear region. According to PubMed:12865408, it localizes in the endoplasmic reticulum; however the relevance of such result is unclear. 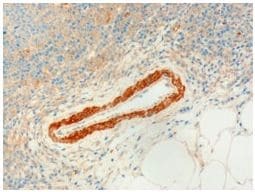 ab5272 at 3ug/ml staining USP20 in human lymph node tissue section by Immunohistochemistry (Formalin/PFA fixed paraffin-embedded sections). Tissue underwent antigen retrieval in microwave in Tris/EDTA buffer (pH 9.0). The HRP-staining procedure was used for detection. ab5272 has not yet been referenced specifically in any publications. Publishing research using ab5272? Please let us know so that we can cite the reference in this datasheet. There are currently no Customer reviews or Questions for ab5272.